I am an admitted Googler. I probably do about 300 Google searches a day and rely on it for all facets of my life. From looking for definitions and spellings to directions, to research for my teachers I Google and I Google a lot. But did you know there are some really cool, specialized search engines that can really narrow your searches and help you discover some really nifty things about this world we live in. 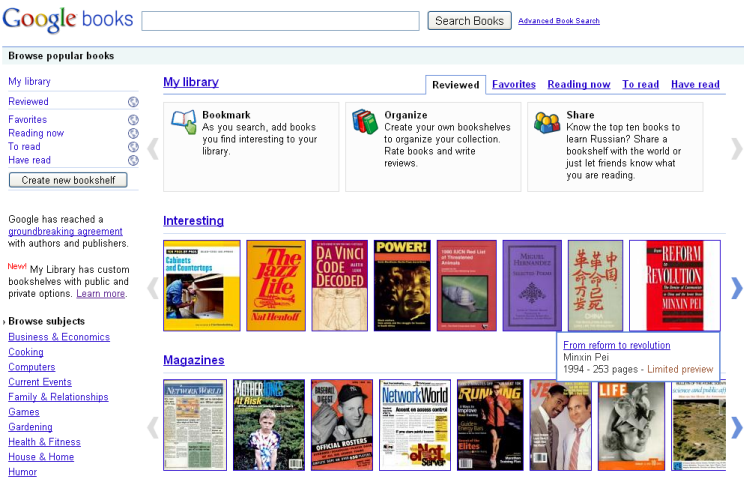 Ok, Google Books has been around for a while and I have neglected using it until I got into my Administrators program. I was able to find my School Law book, a book that costs around $100 bucks on Amazon for free. I can also find tons of other books there that the authors have either agreed to have them hosted for free or they are out of print books that I wouldn't find any other place. Besides books there are tons of magazines, both new and older and if you are an English teacher (or just lover of literature) they have some classics written by Dickens, Longfellow, Defoe and others that you can view online or download in the ePub format. 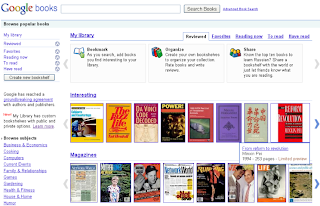 Besides the book search you can create a bookshelf and share books from your bookshelf with other users so if you are a teacher you can create a custom book list and share it with your students. I absolutely love blogs. I get up early in the morning just to catch up on my reader in an attempt to get the pulse of the world of education. If I get a free moment during the day I try to read a post or two. But one of my favorite things to do is find new blogs to read. Just doing a general Google search can be difficult at times to find what I am looking for. So I turn to Google Blog search. No matter how obscure the topic someone out there has a blog on it that you might want to read. Just put in your search term in the box and you are returned just blogs related to that topic. Great for kids doing projects so they can find current events or, better yet, opinions on current event topics, I encourage teachers to have students do a quick blog search when doing a project. I also like blog search to find new education bloggers and get an idea on new and exciting things that are going on in the world of education. As a graduate student I got to know Google Scholar very well. I could search 1000's of peer-reviewed, scholarly articles from the comfort of, really anywhere. Looking for legal opinions, recent research or journal articles, I was hardly ever let down with the content and actually found stuff there I couldn't find anywhere else. The advanced search is very powerful so get to know it well. Have kids (especially middle and high school) look here too when doing research, especially when stressing primary sources. I admit, this might not be one you use a lot. But if you are a science or technology teacher this is a great search engine to try out with your kids. There are over 7 million available patents for search. 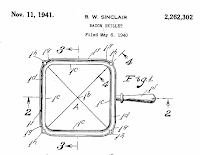 Once you find what you are looking for you get what the applicant says the device does, drawings, any associated patents and detailed descriptions. For students learning design or mechanics this can be a cool place to look for ideas. 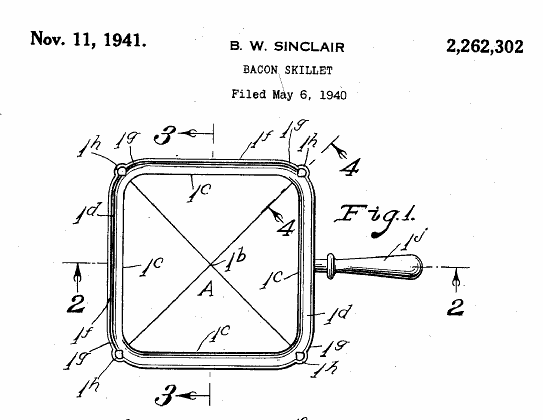 Start by looking at this awesome skillet for cooking just bacon! Those are just 4 of many others that you can check out here. So go forth! Harness the power of Google Search. Be more productive, help kids search effectively and efficiently and find really cool stuff! You know, Day 1 was really amazing. I went to sleep that night thinking how could Day 2 top what I had witnessed at the famed 92nd Street Y? In all honesty, Day 2 was a continuation of the awesomeness that is the real-time web and showed how social media (mainly Twitter) reaches every aspect of our lives. From what we already know like social searches on Google and Bing to using social media to memorialize people who have passed away to how the United Nations is using social media to eradicate Malaria. Social Media is powerful. But it is only made powerful by the people who use it. Twitter, Facebook, Friendster, Diigo, Ning, none would be what they are today without the voices of the masses using them to propel their message. We are truly apart of something special. These are special times and we as educators have to embrace this movement. There were 2 awesome education focused talks yesterday. The first was George Haines, a technology educator on Long Island. In another class his students are reading Animal Farm. When they come to George's class they hop on Twitter and act out the parts. But they also have discussions about the deeper meanings of the book. They took the stage to do a short performance of the book and to talk to the crowd about why they want to use social media and moreover, technology in their classes. You can view their video here. 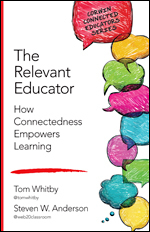 Right afterwards was our panel with myself, Tom Whitby, Eric Sheninger and Kyle Pace. We had the opportunity to talk a little bit about our different perspectives in education and how we see the effects of the real-time web taking a hold in our classrooms and schools. I was very honored to be a part of it and hope you enjoy the discussion. Once again Jeff and the whole #140conf team out did themselves. Thanks to them, the other education panels and everyone who came out and listened to all the characters. And I want to give a special shoutout to the people and city of New York. for my first visit there I could not have asked for more. I hope to return real soon! An amazing first day of some of the coolest social media people on the planet talking about how we, you and me are being changed by the real-time Internet. We heard from MC Hammer and how he is using social media to discover new music for his label. We heard about a man in Isereal who, if you tweet him a prayer will put it in the Western Wall. One of the coolest panels was the GeoLocation panel with Foursquare and Gowalla talking about the future of mobile devices. But really, while all that stuff is interesting, that isn't what we came for. We are here to tell our story about education. On the drive back to Long Island I pondered this post. I was able to do some real reflecting, thinking back to the amazing talk given by Chris Lehmann and how I could capture that. Or the great EDU Panel of Mary Beth, Kevin and Lisa, lead by Arpana that really drove home the point of teaching kids about digital footprints. But then it dawned on me. I would it no way be able to capture either of them in a way that would even begin to capture their moments. Fortunatly for us there is the video archive. So first up, Chris Lehmann, Principal of the Science Leadership Academy in Philly, ignites the crowd and gets them thinking about the future of education. You can also check out the entire archive here. It was an awesome Day 1 and Day 2, I am sure will be more of the same. Oh, and Day 2 has the 2nd EDU panel so be sure to tune into the livestream (http://www.ustream.tv/nyc140conf) to watch or head back here tomorrow to get the archive. I am sitting at the Raleigh-Durham International Airport waiting to catch a flight to the 140 Characters Conference in New York City. What is the #140Conf you are asking yourself? Well, it is the largest gathering of the movers, shakers and groundbreakers in the world of social media. Organized by Vonage founder Jeff Pulver the conference aims at getting to the bottom of the real-time web, mainly, how people from all walks of life use Twitter to make a difference. You might remember I attended last year when it was in Los Angeles and I am so very humbled and honored to be asked to come back and speak. The LA panel made such an impact that among the celebrities like MC Hammer and Ann Curry, among the businesses, media and others there are 2 Education Panels and a talk by Chris Lehmann of the Science Leadership Academy in Philadelphia. The Education Panel on Day 1 is made up of, Mary Beth Hertz, Kevin Jarrett, Lisa Nielson, and moderated by Aparan Vashisht. Their topic centers around how access to the real-time web has effected education. The Education Panel on Day 2 is made up of myself, Tom Whitby, Eric Sheninger and moderated by Kyle Pace. Our panel centers around 3 different perspectives of how educators are embracing social media and the challenges each of us faces. I will be bringing the classroom perspective. Eric brings the administrators prospective and Tom will talk about training a new generation of educators. There are so many other great talks by some amazing characters. If you are in the NYC area and you can catch the show I encourage you to stop by, provided you can find a ticket as it is sold out. But if you can't make it you are in luck! The entire event will be broadcast live via UStream starting tomorrow at 8am. Check out the schedule so you can plan on which panels (besides the education ones) you wanna watch. The event is sure to have tons of laughs, some tears, some amazing insight in to the world of social media and will not disappoint whether you are there in person or watching the stream. I hope to write a little each day of my impressions but be sure to head back here at the end of the week to catch my full reflection! Seems like a no brainer right? Earth, science, they just go together. But Google Earth is way more than a glorified stand alone Google Map. There are so many cool and easy things to explore. Weather-Yep, a weather layer. With a simple click of the mouse you can investigate cloud cover over Antarctica or Thunderstorms over China. Zoom in to your favorite location and you can see the local forecast for that area. 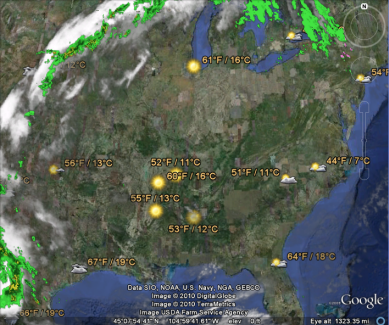 You can download weather animations and load them in and watch how it changes all over the globe. There is also good information on how the weather is gathered and the sources they use. Cousteau Ocean World-These are points all over the globe that provide information about different marine life in their natural environment. Discover the manatees off the coast of Florida, an octopus off the coast of France, or swimming elephants in Malaysia. (Ok, those aren't marine animals but still pretty cool. Each location has a short video and links to read more about it. Animal Tracking- I have to be honest. I had so much fun with these I almost could not turn it off. 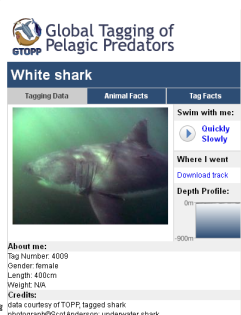 A project called "Global Tagging Pelagic Tagging" has made available marine animal tracking data to the public so we all can learn about the patterns of animals. In this layer you find a tagged animal. For me it was the Northern Bluefin Tuna #5105032. Once I found him (or her. The gender was unknown) I learned so much! There are some cool facts about the tuna and I can see where their habitat is on the globe. I can also learn about the tag that they use to record the data. But the best part...I can follow the tuna along in Google Earth to see where it has been. So cool! There are tons of other animals like the blue whale, humpback whale, and some sharks. State Of The Ocean-This is a very cool layer that has lots of sub layers to examine. One of the important things science teachers have to stress is why need to protect our oceans. Within this layer you can get almost up to the minute ocean observations from buoys all over the world, monitor ocean surface temperature, look at dead zones in the ocean and tons more. This layer is a great way to get kids talking about ocean protection and global climate change. Google Earth is a great program with really endless possibility for any classroom. Check out these layers and tours. And be sure to head over to Richard Byrne's blog Free Tech 4 Teachers to pick up his awesome Google Earth Guide. How do you use Google Earth with your kids? Done something awesome? Share it in the comments! Recently I have done a lot of speaking to different groups on the current state of technology in education. The first thing I tell people is that I am not really an expert. I am not a professor nor have I done years of research to prove some theory. What I do have is classroom experience. What I do have is direct contact with students and teacher and know how technology works and doesn't work in my building and my district. I have a lot of opinions about technology and technology in education that I mostly keep to myself because who am I? I am low on the totem pole of edtech. But there is one thing that really bugs me when some that are high up on the totem poll talk about. Technology as the answer to all our educational problems. Technology is not "the" answer to our educational problems. There are many in our profession who travel this country and the world saying that tech will save us all. And that is just not true. Sure, we are a technology driven society and need to have students who understand how to use technology appropriately but take a look around. All this great technology and we still have millions out of work, budget shortfalls and countless other problems. Putting all of that aside, technology is a crucial "part" of the solution. But again it is not "the" solution. Being that it is part of the solution it has to be embraced by all in education. We as teachers, administrators, school board members and parents can not simply cast technology aside as "another fad" in education. We all have to be both learners and champions of technology in our classrooms and offices. As a Technology Integrator it is my job to help classroom teachers understand that with just a few simple changes to their classroom (via the use of technology) they can have big gains in learning. Beginning this year our 8th grade Language Arts teachers felt they needed to extend their classroom beyond the time they had in class together each day. They took it upon themselves to start class blogs where each day they would post something simple; a poem, quote, very short story, and ask their students for reactions in the comments. At first the comments from the kids were very basic. (I liked this, I did not like this, etc.) But soon, in each group there was that one kid who never spoke out in class and didn't really participate in class who had the most insightful comments. And from then it opened the door to some amazing stuff, that would go on for days. The students would have long conversations about deep, and thought-provoking ideas. This then translated to the classroom. The students were move comfortable around each other so when it was time to share writing in the class everyone volunteered to share. No one would hold anything back. These classes bonded all because their teacher introduced something simple like a blog. Sounds cliche I know but honestly, maybe it isn't so much anymore. We are educating a generation of students who, for most, all these technologies we have access to in schools, they have had access to from the moment their were born. The iGeneration as they have been called have come to expect a different style of education than anyone of us are used to. Kids can't sit in rows for an hour while some boring person stands in front of the class with an overbulleted power point and then expect those same students to be "globally competitive" and "ready for the 21st Century" I hate to break it to a lot of people and a lot of school districts but the prep time is over. We are well into the 21st Century. If there are schools and districts out there still talking about preparing kids for the 21st Century, they have missed the boat. Their kids are already behind. If these kids are not walking into a classroom where they can use a laptop, or cellphone or iPod or clickers, or interactive whiteboard, they are behind. If these kids are only tested in their ability to take a multiple choice test and that is the only measure we are using to see if they are learning, we are subjecting them to a limiting education. If we are not creating classrooms that center around the students, fostering an environment where kids can create using podcasts, Photoshop, Twitter, Google Sites and others, then we might as well throw our hands up and forget about education all together because it would be disservice to this generation to continue in this manor. There are lots of other problems with education but access, availability and use of technology in the classroom should not be one of them. There are pockets of goodness out there. We as a profession need to seek them out, promote their awesomeness and strive to make real change, the change our kids need. Because it isn't about us. 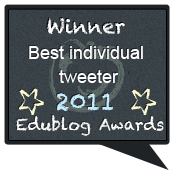 Normally in this space I write about the tools we use to make learning easier, more fun or just plain better. But we all know that learning is not solely about the tools. We know (or at least we should) there are many dimensions to learning. One of those dimensions that we often struggle with (for both students and teachers) is motivation. Helping students feel like learning is something they want to do and need to do. Helping teachers to think differently so they can teach differently. I am a big believer that motivation is mostly intrinsic. Meaning that it has to come from within. Don't get me wrong. We as educators can do a lot for our kids to help them find their motivation. But ultimately it is up to them to want to do. It is the same thing when trying to motivate educators. There is a certain amount that a district or administration can do to help teachers find their motivation. But again, ultimately it is up to the teacher to either to want to do or not. If you have not heard of Dan Pink take some time over the weekend to read about him. He is a fascinating author that, when you read him, really makes you think about yourself and your role in this world. I have been reading his latest book, Drive, for the past couple of days and have just been glued to my Kindle. The book centers around finding out what motivates us as humans and how to capitalize on that to have high satisfaction in work and at home. Before you take a look at the book there are 2 videos you need to see. The first is this one I found on Dan's website that really sums up some thinking I have been doing since my keynote at TeachMeet Nashville. The video is an excerpt from the book and but really could help to start a conversation with your kids or your staff. The other video is Dan speaking at TED. (If you don;t know what TED is, it brings together some amazing thinkers, doers, movers and shakers to have them talk about, really, whatever they want. There is a great website for all the TED videos and an awesome wiki for Teaching With TED.) Here is his also speaking about the book and more about motivation. So think about those 2 things this weekend and head back here. I would love to know what your sentence is and how you think you could use this stuff with kids. Use of Wordle for improving writing. What a great 2 days of learning in Nashville TN last week! There were large groups of teachers learning how to use Twitter and social networking for professional development to small groups of 2 or 3 people in impromptu learning sessions. There was talk about the closing of Etherpad and the use of alternatives like Typewith.me and Primary Pad. There was great discussion about meeting kids where they are and using music and the arts for assessment in the classroom. But best of all was the connections. Twitter is a vast resource with lots of people who drop in and out. I have made tons of Twitter connections with all sorts of different people. But nothing beats meeting people in real life. And the really cool thing is I felt like I already knew these people on a person level. It was so great meeting John, Deron and Shannon from Van Meter. They are really making a difference in the lives of their students and setting the standard for what education should begin to look like. Then there was Philip, Dr. Tatum, Adam, Ric, and Clif. All great guys and great leaders in education. It was awesome being able to share and learn from them. Nancy and Melissa worked so hard over the two days. Melissa presented several sessions passing along some great information on how she uses technology in the classroom and Nancy moderated a interesting panel on social media in education. They both were a valuable asset to the conference as a whole. Then there was Jason, the organizer. After all the talk last week of passion in education it was truly evident with Jason. His dedication, hard work and countless hours spent putting things together really showed and provided a model for other educators to follow as they begin planning their own TeachMeets across the country. I had the honor of giving the closing keynote. My talk centered around the past, present and future of education. Below is the presentation slides I used and the video archive of the keynote. I would love to have your feedback if you watched it live or via the archive here. Oh, and if you hear about a TeachMeet unconference in your area do yourself a favor and make plans to attend. I promise, it's worth it! Over the next 2 days I will participating in TeachMeet Nashville. TeachMeets are unique conference experiences where everyone has an opportunity to share, learn and grow as professional educators. I will be part of a panel on Social Media in Education. I also have the honor of giving the closing Keynote. All sessions will be broadcast live via Ustream and I encourage you to tune in if you can. Thursday Auditorium http://www.ustream.tv/channel/tnteachmeet040110 Starts at 10. Thursday Conference Rooom A http://www.ustream.tv/channel/tnteachmeet040110a Starts at 11. 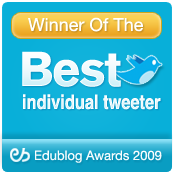 Friday Auditorium http://www.ustream.tv/channel/tnteachmeet040210 Starts at 10. Friday Conference Room A http://www.ustream.tv/channel/tnteachmeet040210a Starts at 10. And you can follow the hashtag #TMN10 on Twitter. It should be an awesome 2 days of learning. Kudos to Jason Bedell for putting all this on and bringing together so many awesome educators in one place! On Tuesday of this week a little bit of passion in education died with the passing of Jaime Escalante. While the name might be meaningless to you, his story is one I bet you might know. You see Jaime taught math in one of the poorest and toughest schools in Los Angeles. As the subject of the 1988 film "Stand and Deliver" we discovered what we always thought. Inner-City kids, no matter their background or their situation can achieve great things. In the movie we see 14 students who had been cast aside as failures. Jaime takes these kids and beyond all odds helps them pass the Advanced Placement Calculus exam, only later to be accused of cheating. Really the only thing we can accuse Jaime of is having passion. He loved his job, cared for his kids and would stop at nothing to help them succeed. He also helped his kids realize their potential and helped them understand that they meant something to world and they were somebody. This week for #edchat the format was a little different. Steve Hargadon and Classroom 2.0 sponsored a webinar with Sir Ken Robinson. The world acclaimed education author joined over 500 educators in Elluminate for a disscusion of his latest book, The Element: How Finding Your Passion Changes Everything. For #edchat it was suggested we do a "warm-up" question, discussion passion in education and how could passion initiate change in education. Once again the discussion was fast but engaging. Here is a taste of what was said. Does passion = good teaching? Can you be a "good teacher" without it? Passion isn't something that is created but rather the results of the conditions under which learning is allowed to occur. To awaken "passion," we must broaden our focus to incorporate time to play, tinker, experiment, EXPLORE. Sometimes I think that my passion for what I do is what makes my job HARDER! It takes one that is passionate about learning in order to be passionate about teaching. Burnout is possible for passionate teachers - especially if they feel unappreciate often - luckily, recharging can happen. As always there is an archive of the entire discussion and I encourage you to read it. Also you can catch the archive of the Sir Ken Robinson webinar. Worth the hour to watch. I wrote about passion not to long ago. In that post I talked about educators who stifle passion in their students. And I can not emphisize that we have to avoid this. Seems like a no-brainer but seriously, whether they know it or not, there are educators out there who are killing the passion for learning in our kids. Tonight at dinner I had the honor of sitting with @johnccarver, the Superintendent of the Van Meter school district in Iowa. They are doing great things with their 1:1 program and if you are not following him on Twitter you are missing out. The point of all this is that this district is fostering passion in kids. This district is allowing students to create and find out what they care about and are supporting them every step of the way. Why are there not more schools and districts out there like this!?! Instead we have too many schools that invite kids in only to spit them out like factory cogs all the long killing any ideas of independence of learning or passion they might have. And on top of that we have educators who are pleased to follow right along. What we need are teachers who care about kids. What we need are educators who have passion for learning themselves and want to foster that love in their students. What we need is teachers who have a fire in their belly for teaching, for discovery and teachers who want their kids to to experience the same. I will admit. There are days when I was teaching I didn't have the passion to do it. There was even a time that I thought about leaving the classroom and education altogether. But when I laid in bed at night thinking about my future I knew what I was doing was the right thing. I cared too much and had too much passion to leave. So do you have passion? When you go into your classroom or your school or your district do your colleagues know you have passion? More importantly, do your students know it?